Looking for Tires? Come to Lloyd's Tire and Automotive for great tires and excellent service! Excellence in Tire and Auto Service! 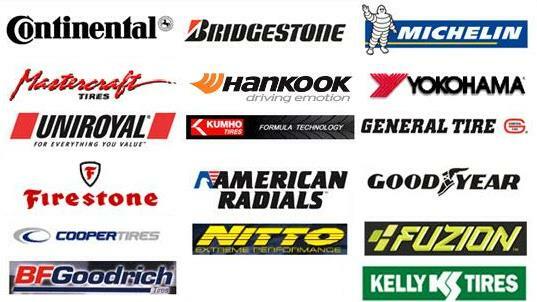 Lloyd's Tire Service offers the best tire brands available. If you're looking for Continental, Bridgestone, Michelin, Mastercraft, Hancook, Yokohoma, Uniroyal, Kumho, General Tire, Firestone, American Radials, Goodyear, NITTO, Fuzion, BF Goodrich, Cooper Tires, or Kelly Tires.. Call us! Lloyd's is your tire service headquarters. The Tire Specialists at Lloyd's Automotive are here to lend a hand. A. Here's an illustration that should help you understand more about your tires. Other options would be no P indicating metric sizing (essentially the same as P-sizing, which has its heritage in Europe) or LT for light truck. LT tires are designed for heavier loads and more rugged service conditions. 2. Width of the tire, in millimeters. The higher the number, the wider the tire. The height of the sidewall section compared to the width of the tire. Example: If this number was a 50, then the tire section is half as tall as it is wide. Short sidewalls deliver crisp handling. Tall sidewalls give a smoother ride. For a specific tire width, the smaller this number, the shorter the sidewall. R indicates radial construction. Unless you specify the other option, bias (which would have a D [diagonal] or B [belted bias] in this position instead of an R), you are purchasing a radial tire. In simple terms, this indicates the distance across the "doughnut hole" of a tire. You must match wheel diameter and the tire opening. 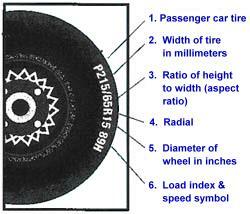 A tire with a 15 size designation will not work on a 14" wheel, and vice versa. Improper matching of wheel and tire size can cause serious injury or death during installation. Includes the load index (a number) and a speed symbol (a letter). About load index, remember: keep the number the same as or greater than the original tires' load index. That number stands for a specific weight carrying capability. Key is that the higher the number, the greater load carrying capacity. So keep the number the same or higher, because your tires are matched to the weight of the car. Never choose a tire with a lower load carrying capacity than the original equipment tire size.